Luscious, creamy cheesecake waits within shells of smooth, decadent chocolate. These Celebrate Cheesecake Pops, the perfect indulgence to be the highlight of any celebration, are hand-dipped in silky chocolate and then hand-decorated with multicolored sprinkles, dots of confetti, or elegant white piping. 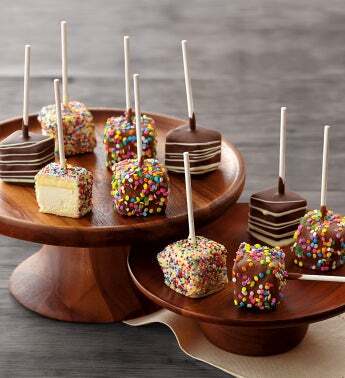 Send cheesecake pop deliveries for birthdays or graduations, or have dessert delivered for a stunning reception or vibrant party.